Karl Glogauer is a disaffected modern professional casting about for meaning in a series of half-hearted relationships, a dead-end job, and a personal struggle. His questions of faith surrounding his father’s run-of-the-mill Christianity and his mother’s suppressed Judaism lead him to a bizarre obsession with the idea of the messiah. After the collapse of his latest affair and his introduction to a reclusive physics professor, Karl is given the opportunity to confront his obsession and take a journey that no man has taken before, and from which he knows he cannot return. Upon arriving in Palestine, A.D. 29, Glogauer finds that Jesus Christ is not the man that history and faith would like to believe, but that there is an opportunity for someone to change the course of history by making the ultimate sacrifice. First published in 1969, Behold the Man broke through science fiction’s genre boundaries to create a poignant reflection on faith, disillusion and self-sacrifice. This is the classic novel that established the career of perhaps contemporary science fiction’s most cerebral and innovative author. Why did I read this book: Browsing my loval Waterstones, I saw this displayed alongside several SF and Fantasy novels. The cover and title grabbed my attention, the blurb did me in. Warning! This review contains spoilers. HOWEVER, given as how the blurb itself spoils the most important FACT about the book, my own spoilers which are necessary for the discussion of the book, are inconsequent and do not, I believe spoil the EXPERIENCE of reading the book.You have been warned! Behold the Man was originally published in 1967 in the New Worlds magazine, winning the Nebula Award that year and published on its own in 1969 with several new editions throughout the years. It is simply put, a brilliant piece of fiction and one of the best novellas I ever read with an extremely flawed, unlikeable-yet-sympathetic protagonist and a potentially explosive subject. But I am ahead of myself. That’s what a truly awesome book will do to me. It begins as Karl Glogauer stumbles out of a broken time machine (a womb-like sphere filled with a fluid that leaks, rendering the object useless) in 28 AD. He is rescued by followers of John the Baptist and nursed back to health amongst this group of Essenes, who believe him to be a magus who will lead them against Rome. Eventually Karl breaks away from the group in order to search for Jesus Christ as his impending crucifixion is the event he has come to witness. When he finds the man, he is shocked to see that Jesus is a blabbering, mentally incapacitated hunchback who lives with his mother Mary (who is so not like a virgin) and his “father” Joseph (a bitter old man) and his brothers and sisters. Karl then does the only thing that a self-aware time traveller can ever do: he takes upon himself to play the role of Jesus Christ, determined to pull it off till the bitter end. But things are never ever as simple as one could hope them to be and this is where the beauty of this book lies. It has so many layers I don’t even know where to start. I can only say that peeling back, or rather observing and absorbing each one was an adventure and a privilege. There is plot, character, writing, format, themes and ideas to consider and all of them come together beautifully. Karl is one of the most messed up characters I have ever had the pleasure to come across. 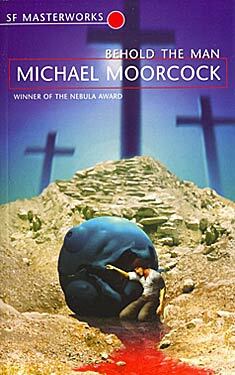 Moorcock alternates the happenings in 28AD with short flashbacks to Karl’s life in the 20th century. From a problematic childhood which includes paedophilia and abuse at an early age to an adulthood overwrought by neurosis including a tendency to stage suicide attempts, masochism, repressed homosexuality, a messiah complex (of course) and a very fucked up view of religion which he associates with sexuality (a silver cross = women; wooden cross =men). We observe several of his relationships, especially one with girlfriend Monica (God, Karl, what you’ll do for attention) with whom he talks about myth, religion and psychology. Karl admires the work of Psychologist Carl G. Jung and hopes to become one, one day but this attempt at becoming something or doing anything with his life is thwarted by another aspect of his own personality , a certain avoidance of reality as it presents itself mingled with self-doubt. Karl is not really a religious character but his obsession with Jesus Christ, and his self-sacrifice is what propels Karl to become a time traveller (well, that and the need to prove Scientific minded Monica wrong). Mind you, the time travelling per se is not really important. We never learn the specifics and the mechanics of how it is even possible but this matters none at all (which quite possibly makes it less “Science” fiction than it ought to be). However, in another stroke of genius, the author does play with the ideas that are often associated with time travel. As any self-aware time traveller will tell you, it is very important to stick with the facts and let history run its course. And that is exactly what Karl tries to do but it opens up the possibility for a glorious MESS of Biblical (hee) proportions. The Crux (hee –sorry so many inevitable puns) of the problem here is thus: because the historical Jesus proves to be an idiot who never did what he was supposed to do, Karl takes upon himself to do what historical events he knows to have happened. But did they really happen? By making the events effectively real – he picks up the 12 apostles, he engineers his arrest and eventual death – he might in fact have changed them all by making then factual rather than symbolic and possibly removing any and all real meaning from it all. And from this comes another layer to be exposed, the difference between myth and religion and beliefs and fact. The absolutely fascinating discussion with his girlfriend Monica about how the myth is unimportant and that the impulse that creates it is the important thing. In this scenario, it is proved by what he has come to witness: Jesus, the historical figure is not the important thing, but how the creation of this myth (because if he never did what he did, then he is most definitely a myth) is fuelled by people’s need to believe in the idea of compassion, of love and forgiveness. Because then the myth of Jesus is less than an individual and more of a collective NEED perhaps stemming from archetypes (which links beautifully with Jung, by the way). It points to the idea that Jesus as a man, doesn’t need to have existed at all, as long as the ideal of Jesus can live on. I find this absolutely beautiful. I have no doubt that to some this idea is completely blasphemous but to me (mind you, I am not religious at all, that needs to be taken into account) organised religion and deep seated belief do not necessarily go together (although they are also not mutually exclusive, obviously). One of the most striking aspects of the book though is how everything is open to interpretation: none of the things I have said so far are exactly final. Karl might or might not have fulfilled a needed historical event or he might or might not have changed things. I also think that what I see as repressed homosexually and connection between religion and sexuality (as he is dying in the cross – a wooden cross mind you – he gets an erection) could probably be the result of trauma as he was sexually abused by men who were connected to the church. Hey, I would even say that Karl is so messed up that maybe, the entire story happens only inside his head. I don’t care, what is important here is the fact that with this short novella Moorcock opened up a dialogue between fiction and me, which made me think, consider, theorise, relate, sympathise and mourn. I have considered and re-considered and found myself unable to find anything remotely resembling a problem or a fault with this novella. Although I am sure they exist because no book can ever be perfect because we are all after all, only humans (behold, the man) subjectively speaking, to ME, the reading experience this book provided, is as perfect as it gets. Notable Quotes/ Parts: At one point, Karl finds himself lost in the desert and has to fight his demons (or Monica, inside his head). Which you know, is exactly what the historical Jesus was meant to have done – so…playing events? Creating them? or living them? Does it matter? Behold the Man is part of the SciFi and Fantasy Masterworks collection that Gollancz has been publishing throughout the years. And now a group of intrepid, awesome bloggers took upon themselves to read and review them all.They even created a blog: Science Fiction & Fantasy Masterworks Reading Project has gone live recently – go and check it out. Also, one of my favourite bloggers, Paul Charles Smith of the excellent Empty Your Heart of Its Mortal Dream is organising a month long event (date to be confirmed) dedicated to Michael Moorcock with contributions s from Jeff VanderMeer,China Mieville, amongst others and Moorcock himself. I can’t wait and will make sure to mention it again once I know more. Verdict: Brilliant and thought-provoking, Behold the Man deserves many acolytes, and a place in my keeper shelf. I definitely have to go and pick this one up – it is right up my alley and it seems like it has enough layers to the story and subtext that the spoilers won’t matter so much. When reading this review, I managed to translate it from thoughtful, intelligent, enthusiastic review-ese to OMG-AWESOME-MUST-GO-GET-IMMEDIATELY-OR-DIE-ese. Which is of course what I am now going to do. How have I never heard of this one? Adding it to my list now. OH MY GOD!!! 😈 Really why haven’t I heard of this book before? I’m going straight to Amazon to order it!!!!! I was blown away. Is it just me, or does this book sound a tad (*cough* that’s really not the word for it *cough*) sacreligious? Up to this point, I’ve loved this website and even have a list of ‘To be read books’, which would, at the moment, be around two hundred if I hadn’t lost my old one. And a majority of the books on that list had been reviewed by you guys. Needless to say, this book isn’t making it. I clicked on the comments, something I never do, hoping to find someone who agrees with me, but no one has. I have to admit, I’m a little ashamed of you guys (though I’m sure Thea has nothing to do with this, so that’s not entirely fair). Sorry if I’ve insulted anyone, but I have to speak my mind with this. I have read the paragraph where Ana says some might think it’s blasphemous, by the way. “Behold the Man was understood by many critics in England as a respectful examination of someone who needs to imitate Christ,as it were. But in the US it got me death threats from some quarters and seemed to give offense to the Baptists, who are no doubt easily offended. Otherwise I got excellent reviews in both the Catholic and Jewish press of the time, as well as in the usual newspapers. In other words, Moorcock’s target wasn’t Christ specifically but demagogues in general. In theory Moorcock could have written a story where Karl Glogauer goes back in time to meet Hitler only to discover that Hitler is a congenital idiot and so in order to keep History ‘on the right track’ decides takes Hitler’s place and proceeds to imitate his life as recorded right up to the Führerbunker in April 1945. It would essentially be making the same point as Behold the Man does (though I think it would be harder to pull off in practice). FWIW, I think the original novella is a more successful work than the novel, an opinion that Moorcock himself now seems to share as well. demon99- thank you for posting these tidbits from the interview. They are very interesting. I didn’t know there was a difference between the first issue and the novella – in which ways do they differ? I am mighty curious now. 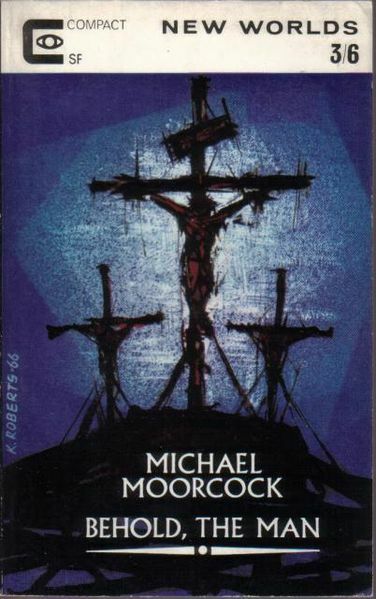 The main differences between the novella (1966) and the novel (1969) is the latter delves more deeply into Karl’s past (including scenes from his childhood in part based on and embellished from Moorcock’s own), which provides a psychological explanation for why Karl decides to live out Christ’s life (and death) when he discovers the ‘truth’ about Jesus. The novel also expands on Karl’s time in Palestine before he takes up Christ’s mantle, including – and this is what ‘spoils’ the novel for me – engineering a sexual encounter between Karl and a very whorish Mary. I’m not Catholic so don’t hold with the dogma that Mary was a perpetual virgin or didn’t have sexual relations with Joseph after Jesus’ birth or that sort of thing, but the scene where Mary basically drops her knickers and shags Karl on the kitchen table left a bad taste in my mouth. I think the novella conveyed the suggestion that Mary is a ‘loose woman of easy virtues’ more subtly and with less ‘shock value’, but then I’d argue that the novella is generally more succinct compared to the novel anyway. An example of the ‘less is more’ principle. Of course, I know people who prefer the novel to the novella, but (IIRC) Moorcock, in his Author’s Note to the 30th Anniversary edition of the novella, says he thinks the novella is probably better as well. In a way I am glad I didn’t know or heard any of this before delving into the book – I ended up perfectly happy with what I read. I wonder how I would feel if I had read the novella first or the threads…..